How to interpret the suspension/withdrawal of credit rating of a company by the credit rating agency? Why the data of debt contained in the credit rating report is different from the data in the annual report? Should an investor completely rely on credit rating reports? Is there a conflict of interest as the company pays for credit rating reports? Where to get the credit rating reports from? Is a credit rating report mandatory for companies? The current article will serve as a complete guide to help investors use to make credit rating reports an integral part of their stock analysis. Credit rating agencies are independent third party organizations approved by market regulators, which provide opinion about the credit strength of any borrower or its debt instrument in the form of credit rating reports. Their role has been widely ingrained in debt markets as the pricing of loans/debt facilities to any borrower is based on its credit strength. Almost all the lenders use the credit ratings assigned by such independent credit rating agencies for their appraisal and pricing of the borrowing entities. Similarly, debt market participants decide about the sufficiency of yield being offered on market instruments like non-convertible debentures (NCDs) or commercial paper (CPs) by issuing companies by looking at their credit rating. In India, there are many approved credit rating agencies. Some of the popular ones are CRISIL (an alliance of Standard & Poor’s), ICRA (an alliance of Moody’s), India Ratings (Ind-Ra, an alliance of Fitch), CARE (owned by Indian Financial Institutions), Brickwork etc, which are very active in assigning credit ratings and preparing credit reports in Indian financial markets. Detailed credit rating reports are available only to their paid subscribers; however, summary credit reports are available publically on their website and serve good purpose for retail investors. The best way to get credit rating reports is to search “Company name Credit Rating” on the internet/Google. The first few results will tell the investor whether the company is rated and if yes, then which credit rating agency has rated it. After that the investor needs to go to the website of the credit rating agency, enter the company name in the search field on the website and then download the summary reports available at the credit rating website. The summary credit rating reports of 2-5 pages are available free to the public. The paid reports are about 8-20 pages long. However, until now, the free reports have sufficed our requirements. A few credit rating agencies, provide all the historical ratings on their website. So it becomes easy to get them. However, other agencies like CARE, keep only last 2 years credit rating reports and remove older reports from public domain. In these cases, searching online to check whether older reports are uploaded on any other site like stock exchanges, moneycontrol etc. might help. Else, the investor might have to buy the reports from the agencies. Alternatively, investors may try contacting the company investor relations dept. to check if they can provide historical reports to the investor. Credit ratings vary on a spectrum of AAA to D where AAA means strongest credit strength/lowest possibility of default and D means lowest credit strength/already defaulted on repayment obligations. Various credit ratings are AAA, AA+,AA,AA-,A+,A,A-,BBB+,BBB,BBB-,BB,B and D. As we move from AAA to D, the credit risk increases and the possibility of the borrower defaulting on its debt servicing obligations increases. As mentioned above, investors in debt markets make extensive use of credit ratings. Credit ratings have been predominantly thought as relevant for debt market participants; however, I believe that they provide a very insightful avenue for equity investors as well. There are many reasons, which make me believe that every stock market investor should read the credit rating report of her target company. She should not restrict herself to the latest credit rating report, but read all the historical credit rating reports available in public domain and understand the story of movement in the credit profile of the target company. Let us first understand the critical features that credit rating reports contain, which are helpful for equity analysts and then analyse the credit rating reports for a sample company as a case study to establish its importance. The credit rating report serves as a key resource of business information, which has been verified by a third party. Many a times, a company does not disclose many of these details on its website or in its annual report considering them as sensitive information. Such information might include market position, kind of relationships with different stakeholders, business characteristics, comparative positioning of its brands, status of its competitors, details of key customers and its business strategy. Credit reports also contain details about the factors leading to the business advantage of the company (MOAT), capacity utilization levels, future expansion plans and updates of ongoing plant constructions/debottlenecking including status of financial closure of such expansions. This is one of the reasons; I read credit rating reports of all the companies I analyse. Credit rating analysts have access to most of the information privy only to the company management, which is not available in public domain but is critical to assess the credit strength of any company. A summary/glimpse of critical sections of such information, which every investor can get in the credit report, sometimes tilts the investing decision in a company’s favour or against it. Such information might include terms of contracts & agreements with buyers & suppliers including cost escalation clauses & formulas, contingency clauses etc., plant capacities & their utilization levels with sales volumes etc. An equity investor or equity research analyst would not get an opportunity to go through these contracts unlike the credit rating analysts. Credit rating agencies based on their knowledge of the industry, peers and company analysis, provide the users a snapshot of key parameters that are expected to affect the performance of the company. Agencies also highlight the key risk factors that might impact the performance of a company negatively, which should be monitored carefully by the investors. Credit rating reports are prepared by financial analysts who analyse the company’s financial information including annual reports while preparing the reports. It serves as another check for the investor that another independent third party has checked the financial information apart from company’s statutory auditor. Credit rating might serve as an independent benchmark for an investor to compare her analysis. E.g., if investor believes that the fundamental position of her target company has improved over the years but on the contrary, finds that the company’s credit rating is going down, then she should recheck her analysis to find out the reasons for such disparity. If an investor notices that the credit rating of a company has improved over the years e.g. from BBB- to A+, then she can be reasonably certain that the company has shown good business performance and as a result its fundamental strength has improved. This is a critical point. I believe that an investor should focus more on the direction of movement of the credit rating of any company rather than its absolute credit rating level. This is not to say that absolute level is irrelevant. However, I would look favorably at a company “A” whose credit rating has improved from BBB- to A- over the years than another company “B” whose credit rating has deteriorated from AA+ to A over the years, even though the current credit rating of company B is higher than that of company A.
Oriental Carbon & Chemicals Limited, an Indian insoluble sulphur manufacturer, has been rated by credit rating company ICRA Limited. Credit rating reports of Oriental Carbon & Chemicals Limited from 2008 are available on website of ICRA Limited. Now let us analyse the key information that credit rating reports of Oriental Carbon & Chemicals Limited have to provide to the stock market investor, which makes studying these reports essential for the stock market investor both as part of initial appraisal as well as regular monitoring exercise. “Oriental Carbon & Chemicals (OCCL) was incorporated in 1978 as Dharuhera Chemicals Limited (DCL) and in 1983 DCL was merged with Oriental Carbon Limited (OCL), a group company engaged in the production of Carbon Black, to form OCCL. Since 1980, DCL’s Chemicals & fertilizers division in Dharuhera was engaged in the production of sulphuric acid, oleum, single super phosphate (SSP), sodium silico fluoride and stabilized liquid sulphur. However, the fertilizer business was deemed unviable; the company exited from the fertilizer business in 2001, and Sulphuric Acid & Oleum production was retained. In 1994, OCCL had set-up a manufacturing facility for the production of Insoluble Sulphur, which is now the flagship product of the company. In 2000, the company realigned its focus to concentrate on Insoluble Sulphur and in the process divested its Carbon Black Unit in favour of Continental Carbon Company of USA. Credit reports of ICRA Limited provide an investor a gist of the market standing of Oriental Carbon & Chemicals Limited viz-a-viz its competitors. Credit reports give an investor about the kind of relationship Oriental Carbon & Chemicals Limited has with its customers. Credit reports of Oriental Carbon & Chemicals Limited provide an investor the critical summary of the business strategy being followed by the company. These inputs can be very vital while understanding the business of the target company and thereby taking the investment decision. Many a times, companies might not disclose the capacity utilization levels, considering it sensitive information. An investor might get such information as part of the credit rating reports. This is one essential section of company’s performance, which is usually provided in credit reports of all the companies. It provides the investor, most of the information required to assess the project execution capability of company’s management & its track record, including any delays, overleveraging etc. “OCCL has recently undertaken a debottlenecking project which would enable the company to increase its existing capacity marginally by January 2009. Going forward, OCCL plans to set up a manufacturing facility in Mundra SEZ. The company expects to benefit from savings from freight for servicing of export orders and other fiscal benefits on account of operations based in SEZ. “The company is expected to implement the project in two phases. In the first phase, the company would set up the facility with the capacity to produce 5,000 MTPA which can be expanded to 10,000 MTPA in the second phase of the project. As mentioned earlier, this is one of the most important reasons; I read credit rating reports of all the companies I analyse. Credit rating analysts have access to most of the information privy to the company management, which is not available in public domain but is critical to assess the credit strength of any company. Credit reports of Oriental Carbon & Chemicals Limited, over the years have provided key inputs, which help the investor understand the evolution of business of the company over the years. “ICRA also notes that the sharp fluctuations in raw material (Sulphur and other petroleum derivatives) prices had adversely impacted the profitability of the company during 2007-08; however, the company has taken measures to pass on the raw material price rise to the customers in a timely manner, which is reflected in the improvement in the profitability of the company during 2008-09. 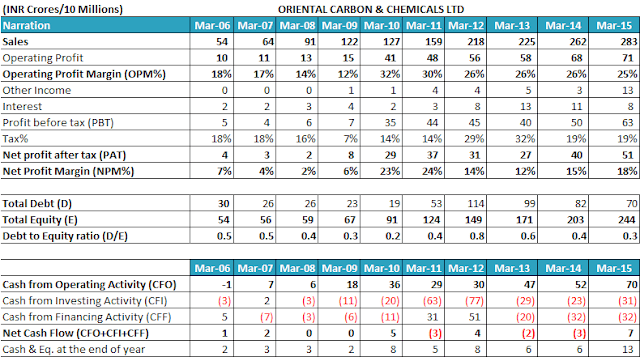 We can notice in the financial details of Oriental Carbon & Chemicals Limited that the operating margins, which declined from 18% in FY2006 to 12% in FY2009, improved to 32% in FY2010 and have been stable at about 25% since then. Therefore, the explanation for sudden improvement and stabilization of margins of OCCL can be found in the credit rating report. This critical input helps investors understand the reasons for improvement in the margins of Oriental Carbon & Chemicals Limited in FY2014. Credit reports of Oriental Carbon & Chemicals Limited help an investor understand the key factors influencing the business performance of the company including the key risk parameters that need continuous monitoring by the investors. “The rating watch follows the recent announcement of acquisition of 50% stakes in Schrader Duncan Limited (SDL) by OCCL. The acquisition of relatively weaker entity SDL, which may become a subsidiary of OCCL, could adversely impact the consolidated financials of the company. The fact of company’s financial statements having been analysed by a credit rating agency of repute and there being no adverse comment about the accounting policies in the credit report, provides another independent check about the quality of accounting practices being followed by Oriental Carbon & Chemicals Limited. Oriental Carbon & Chemicals Limited has witnessed continuous improvement of revenue, profits, margins and reduction in debt over the years. Alongside, the improvement of credit rating of Oriental Carbon & Chemicals Limited from BBB to A serves as a check that the fundamental position of the company have indeed improved over these years. As mentioned above, the improvement of credit rating of Oriental Carbon & Chemicals Limited from BBB in 2008 to A in 2015, serves as a vital evidence that the company has been performing well financially & operationally, thereby leading to improvement in the fundamental position of the company. Thus, we can see that the even the summary credit reports of Oriental Carbon & Chemicals Limited provided publically by ICRA Limited on its website contain very vital pieces of information, which might or might not be available to investors from company website, its annual reports, equity research reports or other public sources. 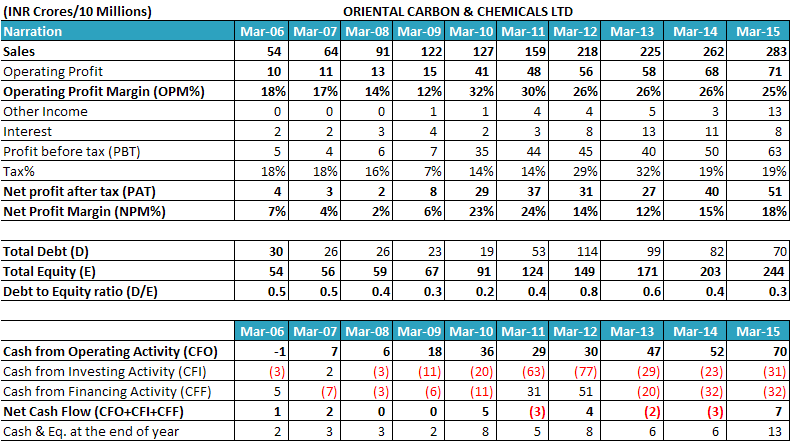 These inputs help an investor understand the business of Oriental Carbon & Chemicals Limited in a better manner and take an informed investment decision. Therefore, I suggest that an investor should read all the available the credit rating reports of all their target companies, including the recent most as well as the historical reports. Reading credit rating reports will add value to her analysis and help her take better investment decisions. OR because there were no outstanding dues to the bank, SBI, hence credit rating not required? I am not quite sure how to read this. As discussed in the workshop, in case of non-cooperation by the borrower with one credit rating agency, investors should check whether the borrower has got credit rating from any other competing credit rating agency. Almost all the companies try to get a higher credit rating and in this attempt, many times companies end up switching their credit rating agency to the one that promises them a higher credit rating. Companies may also switch credit rating agency when due to any reason, the existing rating agency indicates to them that they may downgrade their credit rating. In such circumstances, the companies may try to get themselves rated by another credit rating agency, which may maintain their existing credit rating. Additionally, companies may switch their credit rating agency to reduce their costs. Investors would appreciate that the cost of credit rating is borne by the company. As the credit rating agencies review their ratings at least once every year, therefore, the credit ratings have an annual cost to the companies. In order to reduce the annual cost of credit rating, companies may shift from a costly credit rating agency to a cheaper credit rating agency. In most of the above circumstances, once the company has got a favourable outcome from the alternate/second credit rating agency, then it may stop replying to the email sent by the existing credit rating agency asking for information for conducting review of their credit rating. In such circumstances, the first/existing credit rating agency puts out a report that the company is not cooperating in providing the information and in turn, the rating agency suspends/puts on hold the credit rating. The second reason for suspension of credit rating is upon the repayment of the loan by the borrower. This is a natural event. This is because, getting the credit rating involves cost and when companies repay their loans, then they stop getting credit rated to save on costs. In case, the debt has been paid off, then investors may check the same in the annual report. The absence of the said debt will clear your doubt regarding the suspension of credit rating. However, in case, the debt is still there, then the investor should check whether the company has been rated by any other rating agency. This is usually the most common reason for suspension of credit rating. There might be a third scenario where the company may facing financial/liquidity crunch. In such a situation, none of the credit rating agencies might willing to give it a favourable credit rating. As a result, the company stops providing information to existing credit rating agency, which suspends its credit rating citing non-cooperation. In addition, the company does not get credit rated by any other credit rating agency, as no other agency is ready to give it a good rating. We believe that in most of the situations, a good analysis while selecting the stock for the first time and then regular monitoring will be able to bring out most of the cases where a company is facing liquidity issues. Read: How To Monitor Stocks In Your Portfolio? In case, none of the above situations provides the answer to suspension of the rating, then investor should contact the company directly to get clarification. Any further interpretation should be after getting the response from the company. Read: How to Contact Companies for Clarifications? Can u please explain why there is so much difference in loan /borrowing figures of Electrosteel Castings Ltd. from different sources? The data of total debt in the annual report and the credit rating report is different. Annual report contains the data of debt outstanding at the end of March 31 of any year. Outstanding debt means total debt tranches taken from bank – repayments. It does not include the amount/portion of debt which is sanctioned by the bank but has not been availed/used by the company. Credit rating shows the data of total debt sanctioned by the bank irrespective of whether the company has availed/used it until now or not. Please note that the amount of repayments already done by the company are reduced by credit rating from the data of debt shown in its report. Credit rating report will show only the amount of debt, which is rated by it. There might be more debt, which the company has taken but has chosen to get it rated from a different rating agency. This “other debt” will not be present in the table on the top of the credit rating report. It is important to highlight it again that the table in the credit rating report will carry debt, which is rated by this particular credit rating agency and not the debt that is rated by other rating agencies. This will help you in understanding the difference between the debt data of annual report and credit rating reports. If there is a difference in the data of the debt in different sections of the annual report, then it is advised to seek clarifications from the company asking, which of the different figures is true debt or there is any typographical error in the annual report. Should an investor rely completely on Credit Rating Reports? Hi Vijay, In regard to mischievous adventures / misjudgments of credit rating agencies comes fresh example and a case to study. You have already analyzed Amtek India Limited very well and gave your opinion on high debt which can bring company some trouble in future. The inevitable happened sooner than later and Amtek is running for cover and so kudos to your analysis and judgment. However, I want to bring to your notice, how credit agencies ignored such a prominent fact and both CRISIL and CARE gave AA rating and then CARE downgraded them directly from AA to “no rating” once this issue heated up. These are exactly the cases I am worried about, if one goes by credit ratings and their wisdom to analyse business health. Please do provide your views on it. All the companies of Amtek group have high debt and the problems were visible when I analyzed Amtek India Limited and Ahmednagar Forgings Limited. I believe that they can be representative cases where investors can learn about the impact high debt can have on any company. Regarding your concern that an investor may get hurt “if one goes by credit ratings and their wisdom to analyse business health”, I would say that if an investor uses credit ratings as a replacement for her own hard work then there is a very high probability that she would encounter surprises like Amtek. However, this is true for any case when the investor makes investment decisions based on other’s recommendations and not by her own research. This is equally applicable in case of equity research reports, following high net worth investors, media market specialists or any other source of stock recommendations. Thus, every investor should understand that there is no alternative to own research. www.drvijaymalik.com is one such attempt to help common investors do their own research. Having said that, does it mean that investors should stop reading credit rating reports? The answer is no. Credit rating reports have a lot of relevant information for investors, which has been described in the article. Ignoring the vital information contained in the credit rating reports and focus only on the absolute rating is not desired. Therefore, I believe that an investor should not discredit the entire credit rating document because of cases like Amtek. Credit rating reports provide vital information which is helpful in stock analysis and an investor should not ignore it. How to obtain Credit Rating Reports (latest and historical reports)? Could you please tell us how to get credit rating reports as I have noted that credit rating reports are not freely available to retail investors? The best way to get credit rating reports is to google “Company name Credit Rating”. First few results will tell the investor whether the company is rated and if yes, then which credit rating agency has rated it. After that, the investor needs to go to the credit rating agency website, enter the company name in the search field and then download the summary reports available at the credit rating website. Then, investors may get the credit rating reports from the websites of credit rating agency. The summary report is usually freely available to the public. Investors may need to purchase the detailed report if they wish to read the detailed report. However, we believe that investors should first read the summary report as it also contains a lot of valuable information and then decide whether they want to buy the detailed report. We have found that for our analysis, the summary reports have sufficed our purpose. Dear Vijay, Where can we find the credit rating of last 5 years? I am only able to find credit rating of current year. If I can get past credit rating records of a company then it would be very helpful for my analysis. You may get the past credit rating summary reports on the website of credit rating agencies. E.g. ICRA usually has all the past ratings available on its website. CARE usually has for 1-2 years. In these cases searching online on Google to check whether older reports are uploaded on any other site like stock exchanges, money control etc. might help. Else, one might have to buy the reports from the agencies. Alternatively, investors may try contacting the company investor relations dept. to check if they can provide historical reports to the investor. We do not think that there is any other way to get historical reports. We are not sure whether paid databases like Capitaline, CMIE etc. keep historical reports with them to make available to their subscribers. Otherwise, you may need to contact the credit rating agencies to send it to you by email, which may entail charges. How to interpret the suspension of credit rating for any company? I was researching about the company Control Print Limited. I found that its credit rating by CRISIL was A3+ but it was suspended on November 2013. According to CRISIL FAQs, rating is suspended when disclosure level by the company is low. Is this a bad thing if a company does not have a credit rating? Also, when I look for credit rating in screener.in, many good, debt-free companies like Symphony Limited and DHP India Limited are not rated by any credit rating agency. Are such companies not looking for a credit rating because they do not need to raise debt any time soon in future? A company might stop getting rated by credit rating agencies when it has repaid all its debt, as annual rating has costs attached to it. Credit rating might be suspended by one agency when the borrower decides to shift to another agency, then there might not be any problem with disclosure levels of the company. Otherwise, there can be a real issue and a borrower going through a bad patch may stop rating fearing downgrades. All these are situations, which an investor has to judge. Do you think companies paying to get themselves evaluated by credit agency, will generally get its positives highlighted more than its negatives due to incentives bias (Whose bread I eat, His song I sing)? How do we put that in perspective? Similar thing happened in 2008-09 crises in US and since then credit agencies have lost bit of their trust in fair analysis. Do you think, this information is in market (public) hence will immediately get reflected in price? Hi, Thanks for writing to me! 1) I do not know whether there has been any case where any company would have managed to get a favorable rating, however, I do not think that rating industry survives on earning money by giving positive ratings to borrowers. Credibility of rating agencies depends on their independence and more or less their outputs reflect it. However, this is not to vouch that every rating is right. An investor would have to take her call in this matter. Anyway, I prefer to focus on the trend of rating movement rather than any particular rating. 2) I am not sure about what all factors the market price at any point of time, reflects. Market price movements defy all logic and I try not to have any opinion in this regard. Is a credit rating mandatory for all the companies having debt? Is there a minimum amount or duration of loan that requires a company to go for Credit Rating. I am analysing a small company, which has debt on its books. However, I am unable to find the credit rating report for this company. The credit rating requirement seems to have a minimum loan amount threshold. E.g. for commercial papers, if the amount is more than ₹6 lac, then the credit rating is needed as per RBI guidelines. If we are not wrong, then for bank loans, the minimum threshold may be about ₹10 cr. Loans below the minimum threshold may not need to be credit rated. You may need to search for it a bit. Alternatively, you may directly write to the company about its credit rating. Thank you very much Dr. Malik for this excellent and very descriptive post which combine a lot of things to learn for a newbie like me. I sincerely appreciate your efforts. I was wondering if credit rating reports can also somehow help to learn about the competitors of the company (both organised and unorganized). If yes, how? If not, then what should be the ideal place to look for the peers and competitors (excluding sector/industry list provided by BSE and also various sites like screener which may or may not pick the right peer/competitor)? Thanks for your feedback & appreciation! I am happy that you found the article useful! The summary credit reports, which are available freely for public download, do not contain entire details about the competitors. However, many reports sometimes highlight/give passing reference to the competitors. But it is not a standard part of all the reports. You may get it in some of the reports. However, you can get the details of competitors from other public sources. Like trade databases to check competing exporters etc. A google search would help. Then you may read the credit rating reports of the competitors, if they are credit rated, to improve your understanding of the sector. I have used the financial data provided by screener.in and credit rating reports by ICRA Limited while conducting analysis for this article. This article is not any investment recommendation of any of the stocks discussed in it. The mention of the stocks is purely for illustrative purpose. You may read “SelectingTop Stocks to Buy – A Step by Step Process of Finding Multibagger Stocks” to select fundamentally good stocks for investment. Currently, I do not own stocks of the companies mentioned, except Oriental Carbon & Chemicals Ltd above in my portfolio.